For over thirty years AMX have been providing class-leading AV & Lighting control solutions for executive boardrooms across the globe. Today, new economic challenges and changes in worker behaviour are influencing the office space more than ever before. The corporate culture has changed to a more flexible and digitally native workforce, working collaboratively and efficiently in open plan offices. Multiple huddle rooms provide flexible spaces for people to connect, focus and rejuvenate. 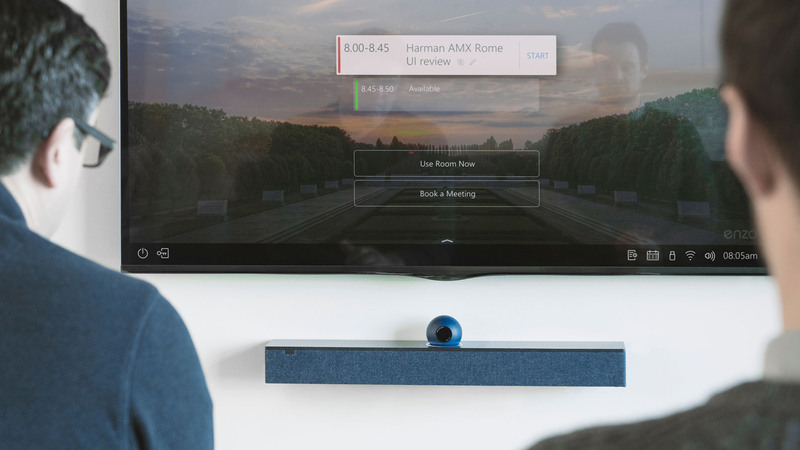 AMX approached Design Partners with the challenge of creating an integrated conferencing experience for modern Huddle spaces. One that was simple and effective for everyone to use, that would elegantly augment modern office interiors, and one that would reimagine the brand in this new office landscape. Most video-conference meetings start with some form of technological hiccup, resulting in late starts, frustration, and an interruption to the natural flow of human interaction. Our focus was on removing this friction and maintaining a sense of flow. Through our research, we ensured that all the user case scenarios were understood and facilitated in an experience that used appropriate technology in a minimal way, enabling people to connect to their meeting quickly and enjoy seamless, high-quality audio and video. 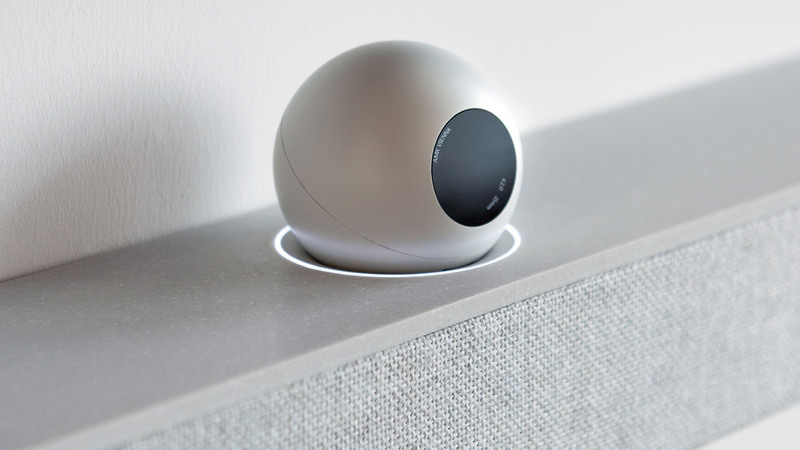 The challenge was not to become yet another anonymous system of components that must be wired together to create a conferencing solution in a meeting room. We created Acendo Vibe and its bespoke user interface to be both instantly distinctive and fully integrated. The shelf-like quality of the Staron surface makes it feel relevant and useful in the huddle room, and it offers a complimentary proportion to the ultra-flat screen displays that occupy modern offices. The iconic relationship between camera and speaker clearly celebrates that this product is as much about video enhancement as it is about sound. 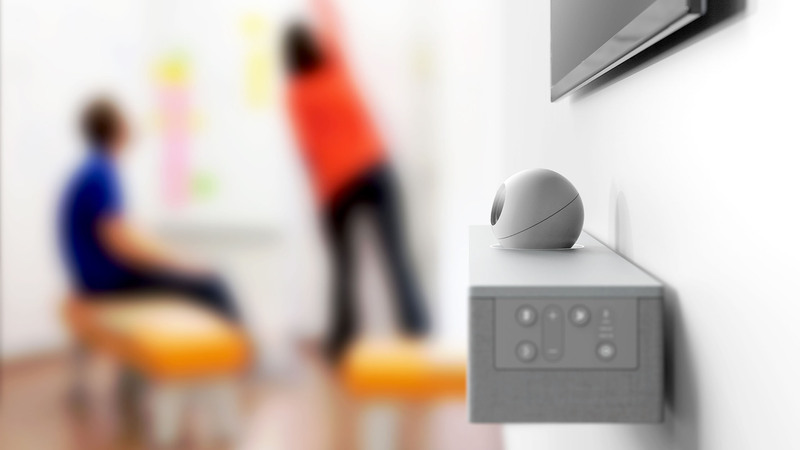 A unique bracket system makes this the simplest soundbar-type device to fit to a wall, making the installers’ jobs easier and the Acendo Vibe a natural choice for specifiers. The home of Acendo Vibe is the modern office – a desirable space in which to work. Furniture and fittings are carefully selected to meet both the emotional and rational needs of the space. It’s critical that technological devices and experiences fit this context, ultimately enhancing both the physical and psychological office environment. As a result, our exploration and selection of materials, colours, textures and interactions all combine to create a natural and minimal experience that is beautiful to look at, as well as use. Form, materials and tone speak to the world of furniture, rather than technology. It comprises an acoustic fabric with a visual and tactile relationship to textiles used within these spaces. The Acendo Vibe is a composed and distinctive design solution worthy of the modern office landscape.